The ability to mount protective immune responses depends on the diversity of T cells. T cell diversity may be compromised by the declining thymic output of new T cells. The aging process imposes a threat to diversity, because thymic function deteriorates. In this study we have examined the relationship between thymic production, homeostatic T cell proliferation and TCR β-chain diversity in young (∼25 years), middle-aged (∼60 years), and elderly adults (∼75 years). TCR excision circles (TREC) as a marker of thymic output exponentially decreased by >95% between 25 and 60 years of age. The frequency of Ki67+ cycling CD4 T cells remained steady, and surprisingly, the diversity of the naive CD4 T cell repertoire was maintained at ∼2 × 107 different TCR β-chains. After the age of 70 years, TRECs only slightly declined, but homeostatic proliferation doubled. The diversity of the T cell pool drastically contracted to 200,000 TCR β-chains. Also, the phenotypic distinction between naive and memory CD4 T cells became fuzzy. The collapse in CD4 T cell diversity during the seventh and eighth decades indicates substantial T cell loss and implies that therapeutic measures to improve vaccine responses will have to include strategies for T cell replenishment. Aging of the immune system has a fundamental impact on health and survival (1). In the elderly, the incidence of severe infection increases, and the protective effect of vaccination wanes. Chronic infections are reactivated, and the increased risk to develop cancer has, in part, been attributed to the decline of immune function with age. Evidence for age-related immune degeneration is already apparent in the sixth decade of life. Pneumonia and influenza infections are the 10th leading cause of death in the age group of 45- to 64-year-old individuals and the fifth leading cause in individuals over the age of 65 years (2). Aging affects all arms of the immune system. Dysfunction has been described for the innate system that provides natural resistance to infections as well as the adaptive immune system that is responsible for acquired and long-standing immunity (3). Aging of the adaptive immune system has been widely appreciated, because it is well known that the involution of the thymus begins at the time of birth and accelerates during adolescence (4). Studies in patients undergoing chemotherapy have shown that the ability to generate new naive T cells from the thymus is minute after 20–40 years of age (5). However, the total number of T cells shows very little decline with advancing age, except in the very old. Also, the proportions of naive and memory T cells are well maintained up to the age of 65 years (6, 7). It has, therefore, been postulated that the majority of naive T cells in the adult are generated by cell division of existing T cells, rather than thymic export (8). Peripheral T cell expansion in response to lymphopenia has been conclusively shown in mouse models and has been termed homeostatic proliferation (9). Studies in humans have also shown continuous T cell turnover, which accounts for de novo production of naive and memory cells in the healthy adult (10). Even in a newborn, peripheral T cell proliferation appears to account for 50% of the daily T cell generation (11); this percentage is likely to be higher in adults. The ability to mount a T cell response to new Ags is highly dependent on the receptor diversity of the naive T cell compartment. New T cell responses can only occur if there are pre-existing naive T cells that recognize the antigenic epitope on a new pathogen. Human naive T cells have been estimated to express ∼10 million different TCR β-chains, each of them paired with 100 different α-chains, giving rise to ∼1 billion different T cells (12, 13). As expected, the diversity in the memory T cell compartment that constitutes T cells previously expanded after an encounter with an exogenous Ag, such as viral infection, is contracted and consists of 105–106 different TCR β-chains, each paired with one or two different α-chains. The enormous diversity of naive cells equips the immune system with the potential to respond to all possible Ags regardless of whether they were from newly emerging infectious agents, such as influenza variants (14), or from self-Ags that are generated during malignant transformation. In contrast, the limited diversity of the memory compartment allows rapid response to recall Ags that have been previously encountered. To assess immunocompetence in the elderly, it is obviously important to know how age affects T cell homeostasis and repertoire diversity. There are very few data on age-related changes in the diversity of the human T cell population. Clonal T cell populations have been described in the memory T cell compartment, and their frequencies appear to increase with age or chronic immune stimulation (15). However, it is not known how thymic decline and the increasing importance of homeostatic proliferation with age affect the diversity of naive T cells. Homeostatic proliferations can, at best and under absolutely random conditions, maintain diversity; only the production of new human T cells in the thymus has a chance to increase diversity. The question of how long the diversity of naive T cells is maintained is of critical importance for developing vaccination strategies. Only a highly diverse naive T cell repertoire is able to respond to newly arising Ags. If the repertoire is contracted, and the generation of T cell responses to novel Ags is unlikely, the emphasis needs to be on boosting existing immunity to determinants that are shared with pathogens previously encountered. We, therefore, examined how T cell generation and T cell homeostasis change with age and how TCR repertoire diversity is affected. PBMCs were obtained from 156 healthy volunteers, aged 18–88 years. The protocol was approved by the Mayo Clinic Institutional Review Board and the Emory University Institutional Review Board, and all participants provided informed consent. Individuals with a serious disease, such as a chronic inflammatory disease, cancer, a history of chemotherapy, advanced atherosclerotic disease or congestive heart failure, poorly controlled diabetes mellitus, or chronic obstructive pulmonary disease were excluded. CD4+CD45RO+ and CD45RO− T cells were purified from PBMC on a FACSVantage (BD Biosciences) to obtain highly purified T cell subsets for TCR sequencing and probe design. For measurements of TCR excision circles (TREC)4 and for the limiting dilution repertoire studies, CD4 T cells were negatively selected using anti-CD8 Abs conjugated to magnetic beads (Miltenyi Biotec). For the repertoire studies with bacterial cloning, CD4 T cells were negatively enriched with human CD4+ T cell enrichment mixture (RosetteSep; StemCell Technologies), and naive T cells were isolated by positive selection with anti-CD45RA magnetic beads (Miltenyi Biotec). Purity was between 94 and 97%. Genomic DNA was extracted from purified CD4 T cells, and TRECs were quantified as recently described (11, 16). PBMCs were stained with anti-CD45RA-FITC, anti-CD45RO-PE, anti-CD4-PerCP, and anti-CD3-allophycocyanin. To determine the frequency of cycling cells, PBMCs were stained with FITC-conjugated anti-Ki67 Abs after permeabilization with 1% Triton X-100 and then with PerCP-conjugated anti-CD4 and PE-conjugated anti-CD45RO Abs (all from BD Biosciences) (11). cDNA from sorted T cell subsets were amplified with TCR BV8 and TCR BC primers, followed by reamplification with BV8 and BJ2S5 primers as previously described (12). PCR products were cloned using a TA cloning kit (Invitrogen Life Technologies) and sequenced. Biotinylated probes spanning the N-D-N region of the TCR sequences were designed. The frequencies of individual TCR sequences were determined by limiting dilution analysis as previously described (12). cDNA from multiple aliquots of serially diluted CD4 T cells were prepared and amplified with TCR BV, BC, and BJ primers in a seminested PCR. Amplified products were labeled with digoxygenin-11-dUTP, then hybridized with the biotinylated probes derived from the same individual using a commercial PCR ELISA kit (Roche). Hybridization signals of >10% of the positive control were considered positive. Frequencies were determined assuming a Poisson distribution. Total RNA was isolated from 500,000 purified naive CD4 T cells using TRIzol (Invitrogen Life Technologies), and cDNA was synthesized. TCR β-chain sequences were amplified in a seminested PCR. The first-round PCR amplification was performed using primers TCR BV8 (5′-ATTTACTTTAACAACAACGTTCCG-3′) and BC (5′-GTGGGAGATCTCTGCTTCTG-3′). Products were reamplified using primers TCR BV (5′-GGGACTCAGCTGTGTACTTCTG-3′) and BJ2S5 (5′-ACCAGGAGCCGCGTGCCT-3′). The resulting amplification products were ∼80–90 bp. For each donor, amplification products were obtained from several aliquot cell samples. Probes were prepared from one of the amplicons and labeled by random labeling (RadPrime DNA Labeling System; Invitrogen Life Technologies). Serially diluted amplicons (0.15–10 ng) from all cell samples were blotted and hybridized with the probe. After overnight hybridization, the membrane was washed and scanned using a PhosphorImager (Molecular Dynamics). The hybridization signals of samples with probe and blotted DNA derived from the same individual, but different CD4 T cell samples, were compared with positive (blotted DNA and probe from the same blood sample) and negative controls (blotted DNA and probe from different donors). In parallel, all TCR amplification products were cloned into vector pCR2.1-TOPO using a TOPO TA cloning kit (Invitrogen Life Technologies). Bacterial colonies were transferred to a nylon membrane, the immobilized DNA was hybridized with the radiolabeled probe, and the percentage of hybridized colonies was determined. Comparisons were conducted as described above for the dot blot. Data were analyzed using a nonparametric Mann-Whitney U test (SigmaStat; SPSS). Until very recently, studies of thymic activity were indirect and based on estimates of the thymic epithelial space. The finding that recent thymic immigrants carry episomal DNA fragments that have been excised during TCR gene rearrangement has permitted a more direct estimate of de novo T cell generation (17, 18). These episomal DNA fragments, also termed TRECs, can be quantified by real-time PCR. The results for CD4 T cells in a cohort of individuals ranging in age from 18 to 90 years are shown in Fig. 1⇓. Young adults have a median of ∼4000 TRECs/3 × 105 cells. The majority of TREC+ T cells only express a single TREC and very few T cells, at most two TRECs per cell; these data, therefore, indicate that ∼1–2% of all CD4 T cells in this age group expressed such a DNA episome and represented cells that had not divided and presumably had recently emigrated from the thymus. There was a considerable variability in the frequency of TREC+ cells in young adults. With increasing age, the frequency of TREC+ cells progressively and significantly decreased. In addition, the variability within each age group declined, and individuals ≥55 years of age uniformly had a very low frequency of TREC+ cells. However, even between the age group of 55–69 years and the age group of 70–90 years, there was a significant decline in TRECs. These data document that the thymic output after the age of 55 years is very minimal. It is currently not known how stable TREC expression in individual cells is in the absence of proliferation. The data shown in Fig. 1⇓, therefore, represent an upper estimate of thymic activity in the different age groups. It is possible that the small frequency of TREC+ cells in older individuals represents the survival of TREC+ cells rather than minimal ongoing thymic activity. Age-dependent decline in thymic output. CD4 T cells were purified from healthy individuals aged 18–88 years, and the number of TREC was quantified. Results are shown as box plots for different age strata, displaying medians, 25th and 75th percentiles as boxes, and 10th and 90th percentiles as whiskers. TREC concentrations were very low after the age of 55 years, suggesting that thymic output after this age is minimal at best. To answer the question of whether the decline in thymic output leads to a relative increase in the memory compartment at the expense of the naive compartment or whether the decreased influx is compensated for by increased peripheral proliferation of naive T cells, we determined the frequencies of naive and memory cells and the relative fraction of cycling T cells that express Ki67. CD45 splicing variants allow for a relatively specific distinction between naive and memory CD4 T cells. As shown in Fig. 2⇓A, CD45RA and CD45RO populations within CD4 T cells are clearly distinct in young and old adults. There is a small CD45RO CD45RA double-positive population that is sometimes expanded in older individuals. In contrast to CD8 T cells, CD4 T cells lacking CD45RO expression do not have a phenotypic marker profile associated with effector cells, such as loss of CD28, CD27, or CD7 (data not shown). Consistent with published results (6, 7), the frequencies of CD4+CD45RO− T cells varied widely between individuals. There was an increase in CD45RO+CD4 T cells at the expense of CD4+CD45RO− T cells with age, which only reached significance after the age of 70 years (p = 0.004). The magnitude of this increase was small (Fig. 2⇓B). Homeostatic proliferation of naive and memory CD4 T cells. A, Two-color staining with Abs to CD45RO and CD45RA allows for distinguishing between two single-positive populations and a small double-positive population. Representative examples from a young and an old adult are shown. CD45RO−CD4+ T cells did not have any phenotypic characteristics of memory/effector cells (data not shown) and were considered to constitute naive cells. B, The frequencies of CD4+CD45RO+ T cells only slightly increased with age. The increase was only significant after the age of 70 years (p = 0.004). C, Turnover of naive (left) and memory CD4 T cells (right) was separately estimated from the frequency of cycling Ki67-expressing cells, as determined by flow cytometry. Homeostatic proliferation was approximately steady up to the age of 70 years, after which it increased. 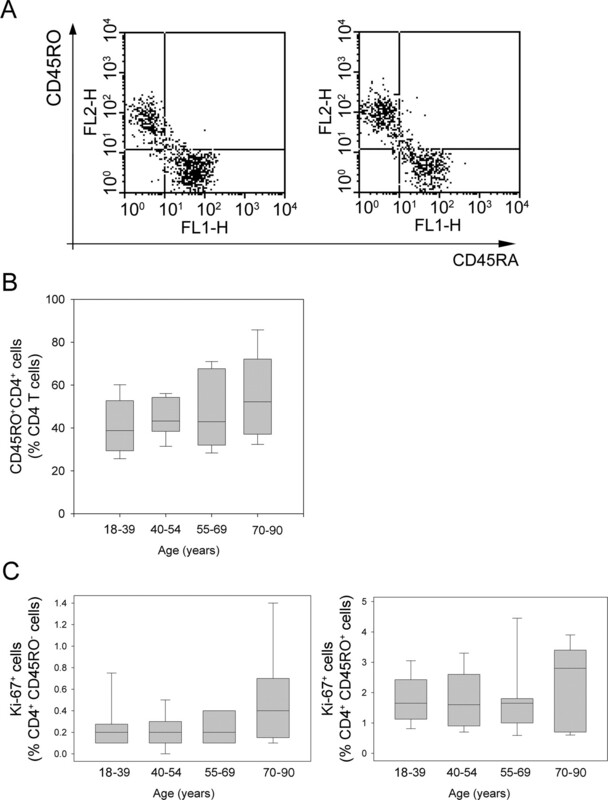 The turnover of CD45RO−CD4 T cells was very stable between the ages of 18 and 69 years and was tightly regulated, with 0.1–0.4% of CD45RO−CD4+ T cells in cycle at any particular time (Fig. 2⇑C). Ki67 staining has been shown to highly correlate with in vivo turnover studies using deuteriated glucose or water (10, 19). Our data would therefore indicate a daily production rate of ∼200 million naive T cells. Only after the age of 70 years is the frequency of cycling CD45RO−CD4 T cells doubled. The frequency of cycling CD4 CD45RO+ T cells was ∼10-fold higher than that for naive cells, consistent with the increased turnover that has been described for memory T cells (20). Again, there was no obvious change in cell proliferation up to the age of 69 years, and only after this age was the frequency of cycling memory T cells increased. 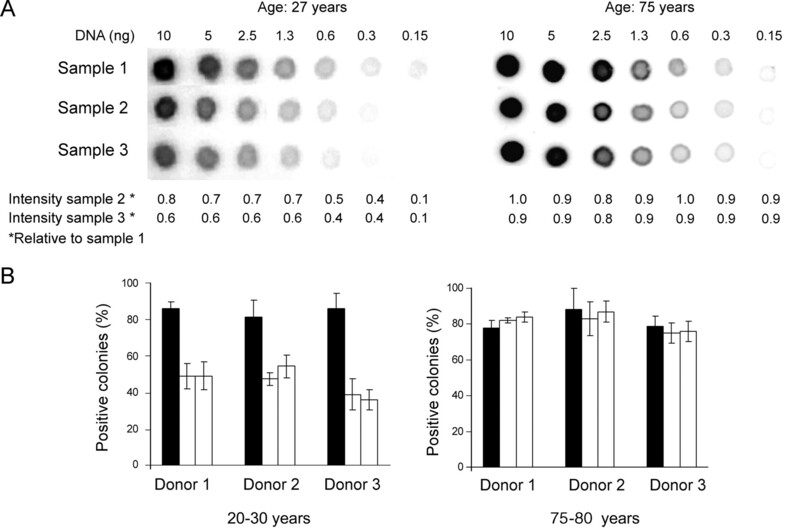 Thus, naive T cells from healthy individuals are in constant turnover; however, the turnover rate is narrowly controlled up to the age of 70 years and does not correlate with decreased thymic activity. Memory T cells have a nearly 10-fold higher turnover than naive T cells. Despite the declining influx of new naive T cells from the thymus and the lower turnover rate of naive T cells, the relative size of the naive compartment was well maintained up to age of 70 years. The memory T cell compartment is only minimally expanded at the expense of the naive T cell compartment, suggesting that the sizes of both compartments are independently controlled (21). To estimate the receptor diversity of the T cell compartment, naive and memory CD4 T cells were purified based on the expression of the cell surface marker CD45RO and ∼50 unique TCR sequences in each sample were identified. Oligonucleotide probes specific for the unique sequence stretch of each TCR were designed. The frequency of each TCR was determined in a second blood sample obtained from the same donor within 2 mo, using a limiting dilution system and a combination of PCR and oligonucleotide hybridization. Three healthy individuals for each of three age ranges (25–30, 60–65, and 75–80 years) were selected. All nine individuals were representative for their respective age group in terms of TREC concentration, frequency of naive and memory T cells, and frequency of cycling cells. Results summarizing the diversity of naive CD4 T cells are shown in Fig. 3⇓. In the three individuals between the ages of 25 and 30 years, >60% of all TCRs were too infrequent to be detected, suggesting that their frequency was <1 in 20 million. The other 40% of TCR sequences were mostly present at frequencies of up to 1 in 200,000, suggesting that these cells had undergone homeostatic proliferation. Age and naive TCR β-chain diversity. TCR diversity was estimated in three individuals, each of whom represented one age group. CD45RO−CD4+ T cells were isolated, random samples of TCR β-chains were sequenced, and the frequencies of these sequences were determined in a subsequent blood sample of the same individual by limiting dilution and PCR/oligonucleotide hybridization. Within each age group, the frequency spectrums in the individuals studied were not different, and a summary of the frequency spectrum is, therefore, shown. Diversity was maintained up to the age of 65 years, but then dramatically contracted. Surprisingly, compared with young adults, the frequency distribution was not different in individuals aged 60–65 years, although these individuals had lost at least 90% of their thymic activity and had an additional 40-year history of homeostatic proliferation. The repertoire continued to be very diverse with a median frequency of 1 in 20 million, suggesting that homeostatic proliferation was sufficiently random to maintain diversity. The repertoire diversity dramatically changed within the next decade of life. All three individuals (aged 76, 77, and 80 years) had severely contracted repertoires. The vast majority of TCR sequences were present in frequencies of >1 in 200,000, suggesting that these individuals had preserved <1% of their naive T cell repertoire diversity. The findings were very similar in all three individuals studied, and all three were healthy elderly subjects without major apparent comorbidities. The repertoire contractions after the age of 65 years were very striking, and the rapidness of repertoire deterioration was astounding, given that diversity had been maintained for many years with minimal to no thymic input. We, therefore, set out to develop a diversity assay that can be more easily applied to a larger population than the limiting dilution assay, but is more sensitive than TCR spectrotyping. We reasoned that if the repertoire diversity is ∼200,000 TCR β-chains, a sample of 500,000 naive CD4 T cells should give a complete representation of the repertoire. In contrast, if the diversity is as large as it is in the young adult, any two samples of 500,000 naive CD4 T cells from the same donor should have a greatly different repertoire. Naive CD4 T cells were purified from three additional young (20, 21, and 27 years) and three more old (75, 75, and 80 years) adults, aliquoted into samples of 500,000 cells and a 80- to 90-bp sequence of the BV8-JB2S5 TCR spanning the N-D-N region was amplified from each sample. The PCR products from all samples were blotted and hybridized with a radiolabeled probe from one of these samples. Representative results are shown in Fig. 4⇓. For the young adult, the probe bound ∼2-fold stronger to the amplicon received from the same cell sample than to amplicons from other cell samples of the same donor. The binding on the amplicons from other cell samples of the same donor was not significantly different from the hybridization to samples from other donors, suggesting that it probably represented background hybridization to shared BV and BJ sequences rather than sharing of identical N-D-N regions. Results for the older donor were very different. No differences in hybridization intensities were seen between the amplicons from different cell samples, suggesting that the repertoires of all samples of 500,000 cells were identical, i.e., each of them gave a full representation of the repertoire. Contraction of naive TCR β-chain diversity after 75 years of age. The limiting dilution analysis in Fig. 3⇑ suggested a repertoire size of < 0.5 × 106 TCR β-chains in donors older than 65 years. A dot-blot assay was developed to confirm this result in additional donors. Eighty- to 90-bp TCR N-D-N region fragments were amplified from replicate samples of purified CD4+CD45RO− naive T cells from the same donor. A, Serial dilutions of the amplified sequences were blotted. A representative example is shown for three cell samples from a young (27 years old) and an old (75 years old) donor. The immobilized sequences were hybridized with probes prepared from the first cell sample of the young and the old donors, respectively. The signals were quantified using the ImageQuant program. B, Amplified sequences from several cell samples were cloned, blotted, and hybridized with a probe from the first cell sample of the same individual. The number of positive colonies was counted, and results are expressed as the mean percentage from several blots. ▪, Results when colonies and probe derived from the same cell sample (positive control); □, results when colonies and probe were from distinct cell samples of the same donor. To allow for a more detailed analysis, PCR products from each of the cell samples from each donor were cloned and then hybridized with a radioactive probe from the same or a different amplification product. In the young adults, the TCR probe hybridized to ∼90% of clones from the identical sample and only to 40% of a different cell sample from the same donor, indicating the high diversity of the repertoire (Fig. 4⇑B). In contrast, the probe derived from the elderly individuals bound equally well to the vast majority of clones regardless of whether they were derived from the same or a different blood sample. As expected and as previously reported (12, 13), the repertoire of memory T cells was less diverse than that of naive T cells (Figs. 3⇑ and 5⇓), reflecting the phenomenon that memory T cells have been selected and clonally expanded from the naive repertoire upon Ag encounter. At the level of the TCR β-chain, memory T cells in young adults only showed 5–10% of the diversity seen for naive T cells, and the median frequency was about one in 700,000 (Figs. 3⇑ and 5⇓). This difference also documents that the phenotypic definition of naive and memory T cells is quite accurate. Again, this diversity was well maintained up to the age of 65 years; the overall frequency distribution of memory TCRs was essentially unchanged. Surprisingly, the diversity of memory cells again contracted dramatically between the age of 65 and 75 years, and individuals older than 75 years were left with a rather small repertoire of memory T cells. Contraction of memory TCR repertoire with age. TCR β-chain diversity of CD4+CD45RO+ memory T cells was estimated by limiting dilution/oligonucleotide hybridization as described in Fig. 3⇑. Results are pooled for three individuals for each of the three age groups. Compared with naive CD4 T cells, memory T cells are ∼10-fold less diverse. This diversity is again maintained up to the age of 65 years, after which it collapses. After the age of 75 years, the diversities of naive and memory T cells were not markedly different, raising the possibility that the phenotypically defined naive and memory CD4 T cells are not clearly distinct in the elderly, but overlapped and harbored identical TCR sequences. In the 25- to 30-year-old and 60- to 65-year-old individuals, the finding of a TCR sequence shared by naive and memory CD4 T cells was the rare exception. In contrast, in the 75- to 80-year-old individuals, many sequences were found to be shared (Fig. 6⇓). Taken together with the finding of severe repertoire contraction, these data indicate that at this age, naive CD4 T cells are severely depleted, and memory T cells are phenotypically masquerading as naive T cells. Alternatively, the increased homeostatic turnover of naive T cells may be associated with phenotypic shifts. Lack of phenotypically distinct naive and memory T cell compartments in the elderly. TCR β-chains were sequenced from highly purified CD45RO− naive and CD45RO+ memory CD4 T cells. Results are shown for three healthy individuals aged 76, 77, and 80 years. The repertoires of naive and memory T cells were largely overlapping, with about one-third of the sequences shared (light shading). Sequences unique for the CD45RO+ or CD45RO− CD4 T cell subset are indicated as dark shading. In contrast, the repertoires of naive and memory T cells were clearly distinct in individuals younger than 65 years; shared sequences were not found (data not shown). In this manuscript we show that the repertoire of naive CD4 T cells is very well maintained up to the age of 65 years; however, it dramatically dwindles in subsequent years and is severely contracted and not distinguishable from the repertoire of memory T cells at 75–80 years of age. This finding has important implications. The diverse repertoire of naive T cells is needed to initiate a T cell response to new Ags, e.g., newly emerging viruses, such as severe acquired respiratory syndrome (22); antigenic drift of existing viruses, such as influenza virus (14); or new Ags used in tumor vaccination protocols (23). If the naive repertoire is severely contracted in diversity, the likelihood of finding fitting TCRs to meet new antigenic challenges is minute. Priming of immune responses should, therefore, be attempted as long as diversity is intact, whereas vaccination strategies after that age threshold should focus on boosting existing memory T cell responses. Because of the enormous diversity of the human TCR repertoire, diversity studies have been extremely difficult to perform. Most of the diversity studies have focused on identifying clonally expanded T cell populations and have described the emerging clonal population as a function of age and/or chronic immune stimulation (15, 24). The most frequently used technique is TCR spectrotyping, which is based on the finding that the frequencies of TCRs with different lengths follow a Gaussian distribution. Deviation from a Gaussian distribution indicates oligoclonality and lack of diversity. These studies have allowed conclusions on the diversity and function of memory T cell populations; clonally expanded T cell populations are frequently characterized by unusual phenotypes as a consequence of senescence (25, 26). However, neither spectrotyping nor phenotypic studies are sensitive enough to ascertain the naive T cell repertoire, which is essential to predict the likelihood of primary T cell responses. There are only two reports on very few individuals that provided a comprehensive in-depth analysis of TCR diversity. Arstila et al. (13) have estimated the diversity in three individuals by completely sequencing a small window of the TCR repertoire and extrapolating the result to the total repertoire. The ages of these three individuals are unknown. The second paper compares the repertoire in six patients with rheumatoid arthritis and seven age-matched controls using a limiting dilution assay that was also used in this study (12). The frequency distribution of TCR β-chains in this later study is very similar to the results obtained for young and middle-aged adults in the study we performed. Both of these studies, as well as the data shown in Figs. 3⇑ and 6⇑ demonstrated that the repertoire of TCR β-chains in the memory T cell population was ∼10-fold less diverse than that in the naive population. This consistent and clear difference in diversity confirms that the phenotypic definitions of naive and memory CD4 T cells are accurate, and that although phenotype conversions occur, they are the exceptions, not the rule, in CD4 T cells. One of the surprising findings in our study was that the decline in diversity was not linear, but there appeared to be a threshold age. Up to the age of 65 years, the diversity of the naive T cell population was very high; however, it deteriorated very rapidly after that age. It is unclear what variables determine this threshold. Thymic production, as determined by TREC concentration, declined steadily with age. A recent study of thymic function after autologous bone marrow transplantation documented that the majority of patients after 40 years of age and essentially none of the patients after 50 years of age had sufficient thymic activity to rebuild a naive T cell compartment (27). Homeostatic proliferation that occurred at a frequency of 0.1–0.4% of all naive T cells therefore appears to be the major source of T cell generation during adult life. Our data document that diversity up to age 65 years is maintained with minimal to nearly absent thymic production. Homeostatic proliferation that essentially turns over the entire T cell pool within 1–2 years must, therefore, be highly random and unbiased. This scenario rapidly changed after the age of 65 years. There was some additional decline in the frequency of TREC+ cells after that age; however, this decline, although statistically significant, was minimal. It is possible that even very minimal influx of new thymocytes is sufficient and necessary to maintain diversity, and this is no longer the case after the age of 65 years. Alternatively, individuals over 65 years of age may have increased spontaneous T cell activation and transition of naive T cells into memory cells. Such a mechanism has been shown in animal models, where it was associated with increased T cell turnover, apoptosis, and eventual lymphodepletion (28, 29). Most recently, such a mechanism has also been implied in the depletion of naive CD4 T cells that is characteristic of AIDS (30). In this context, the increased frequency of cycling naive and memory cells in individuals older than 65 years may be interpreted as heightened T cell activation and not an increase in compensatory T cell proliferation. The findings have immediate implications for clinical management as well as for future research. Despite minimal or no thymic activity in the second half of life, mechanisms exist that are able to sustain a diverse repertoire of naive T cells for many years. During this time, vaccinations against new infectious agents seem sensible, and modifications of the costimulatory conditions and use of adjuvants have the promise to optimize the vaccine response. Additional research needs to focus on ways to extend this steady state of the immune system to later stages of life. As long as this is not achieved, immune priming should be concluded by the age of 65 years, and vaccination in later years should focus on optimizing existing memory T cell responses. ↵1 This work was supported by grants from the National Institutes of Health (AG15043 and AI57266). ↵2 G.L. and A.N.V. contributed equally to this work. ↵4 Abbreviation used in this paper: TREC, TCR excision circle. Grubeck-Loebenstein, B., P. Berger, M. Saurwein-Teissl, K. Zisterer, G. Wick. 1998. No immunity for the elderly. Nat. Med. 4: 870. Centers for Disease Control and Prevention (U.S.). 1998. National Vital Statistics Report 1998. Natl. Vital Stat. Rep. 47: 26. Albright, J. F., J. W. Albright. 2003. Aging, Immunity, and Infection 1 Human Press, Totowa. .
Haynes, B. F., M. L. Markert, G. D. Sempowski, D. D. Patel, L. P. Hale. 2000. The role of the thymus in immune reconstitution in aging, bone marrow transplantation, and HIV-1 infection. Annu. Rev. Immunol. 18: 529-560. Mackall, C. L., T. A. Fleisher, M. R. Brown, M. P. Andrich, C. C. Chen, I. M. Feuerstein, M. E. Horowitz, I. T. Magrath, A. T. Shad, S. M. Steinberg, et al 1995. Age, thymopoiesis, and CD4+ T-lymphocyte regeneration after intensive chemotherapy. N. Engl. J. Med. 332: 143-149. Fagnoni, F. F., R. Vescovini, G. Passeri, G. Bologna, M. Pedrazzoni, G. Lavagetto, A. Casti, C. Franceschi, M. Passeri, P. Sansoni. 2000. Shortage of circulating naive CD8+ T cells provides new insights on immunodeficiency in aging. Blood 95: 2860-2868. Hirokawa, K., M. Utsuyama, M. Kasai, C. Kurashima, S. Ishijima, Y. X. Zeng. 1994. Understanding the mechanism of the age-change of thymic function to promote T cell differentiation. Immunol. Lett. 40: 269-277. Mackall, C. L., R. E. Gress. 1997. Thymic aging and T-cell regeneration. Immunol. Rev. 160: 91-102. Goldrath, A. W., M. J. Bevan. 1999. Selecting and maintaining a diverse T-cell repertoire. Nature 402: 255-262. Neese, R. A., L. M. Misell, S. Turner, A. Chu, J. Kim, D. Cesar, R. Hoh, F. Antelo, A. Strawford, J. M. McCune, et al 2002. Measurement in vivo of proliferation rates of slow turnover cells by 2H2O labeling of the deoxyribose moiety of DNA. Proc. Natl. Acad. Sci. USA 99: 15345-15350. Schonland, S. O., J. K. Zimmer, C. M. Lopez-Benitez, T. Widmann, K. D. Ramin, J. J. Goronzy, C. M. Weyand. 2003. Homeostatic control of T-cell generation in neonates. Blood 102: 1428-1434. Wagner, U. G., K. Koetz, C. M. Weyand, J. J. Goronzy. 1998. Perturbation of the T cell repertoire in rheumatoid arthritis. Proc. Natl. Acad. Sci. USA 95: 14447-14452. Arstila, T. P., A. Casrouge, V. Baron, J. Even, J. Kanellopoulos, P. Kourilsky. 1999. A direct estimate of the human αβ T cell receptor diversity. Science 286: 958-961. Cox, N. J., K. Subbarao. 1999. Influenza. Lancet 354: 1277-1282. Posnett, D. N., R. Sinha, S. Kabak, C. Russo. 1994. Clonal populations of T cells in normal elderly humans: the T cell equivalent to “benign monoclonal gammapathy.”. J. Exp. Med. 179: 609-618. Koetz, K., E. Bryl, K. Spickschen, W. M. O’Fallon, J. J. Goronzy, C. M. Weyand. 2000. T cell homeostasis in patients with rheumatoid arthritis. Proc. Natl. Acad. Sci. USA 97: 9203-9208. Kong, F. K., C. L. Chen, A. Six, R. D. Hockett, M. D. Cooper. 1999. T cell receptor gene deletion circles identify recent thymic emigrants in the peripheral T cell pool. Proc. Natl. Acad. Sci. USA 96: 1536-1540. Douek, D. C., R. D. McFarland, P. H. Keiser, E. A. Gage, J. M. Massey, B. F. Haynes, M. A. Polis, A. T. Haase, M. B. Feinberg, J. L. Sullivan, et al 1998. Changes in thymic function with age and during the treatment of HIV infection. Nature 396: 690-695. Hellerstein, M., M. B. Hanley, D. Cesar, S. Siler, C. Papageorgopoulos, E. Wieder, D. Schmidt, R. Hoh, R. Neese, D. Macallan, et al 1999. Directly measured kinetics of circulating T lymphocytes in normal and HIV-1-infected humans. Nat. Med. 5: 83-89. Sprent, J., C. D. Surh. 2001. Generation and maintenance of memory T cells. Curr. Opin. Immunol. 13: 248-254. Freitas, A. A., B. Rocha. 2000. Population biology of lymphocytes: the flight for survival. Annu. Rev. Immunol. 18: 83-111. Ada, G.. 2001. Vaccines and vaccination. N. Engl. J. Med. 345: 1042-1053. Goronzy, J. J., P. Bartz-Bazzanella, W. Hu, M. C. Jendro, D. R. Walser-Kuntz, C. M. Weyand. 1994. Dominant clonotypes in the repertoire of peripheral CD4+ T cells in rheumatoid arthritis. J. Clin. Invest. 94: 2068-2076. Weyand, C. M., J. W. Fulbright, J. J. Goronzy. 2003. Immunosenescence, autoimmunity, and rheumatoid arthritis. Exp. Gerontol. 38: 833-841. Vallejo, A. N., C. M. Weyand, J. J. Goronzy. 2004. T-cell senescence: a culprit of immune abnormalities in chronic inflammation and persistent infection. Trends Mol. Med. 10: 119-124. Hakim, F., S. Memon, R. Cepeda, E. Jones, C. Chow, C Kasten-Sportes, J. Odom, B. Vance, B. Christensen, C. L. Mackall, et al 2005. 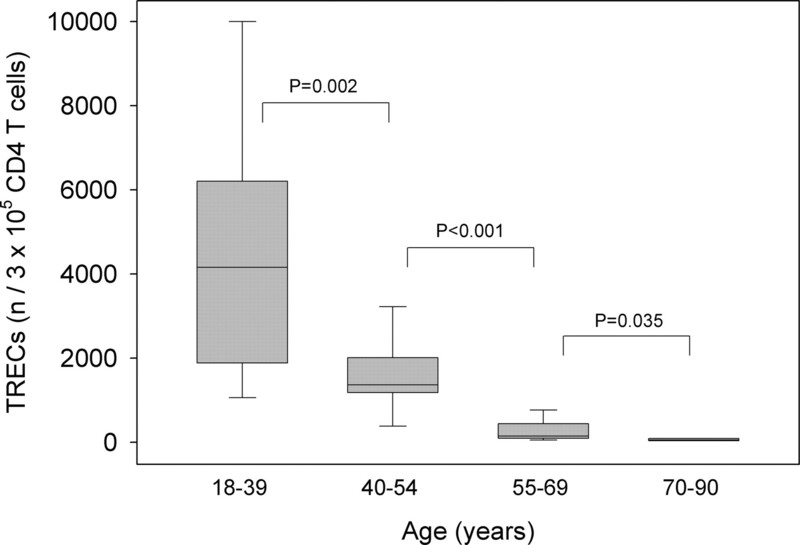 Age-dependent incidence, time course, and consequences of thymic renewal in adults. J. Clin. Invest. 115: 930-939. Tesselaar, K., R. Arens, G. M. van Schijndel, P. A. Baars, M. A. van der Valk, J. Borst, M. H. van Oers, R. A. van Lier. 2003. Lethal T cell immunodeficiency induced by chronic costimulation via CD27-CD70 interactions. Nat. Immunol. 4: 49-54. Kuo, C. T., M. L. Veselits, J. M. Leiden. 1997. LKLF: A transcriptional regulator of single-positive T cell quiescence and survival. Science 277: 1986-1990. Papagno, L., C. A. Spina, A. Marchant, M. Salio, N. Rufer, S. Little, T. Dong, G. Chesney, A. Waters, P. Easterbrook, et al 2004. Immune activation and CD8+ T-cell differentiation towards senescence in HIV-1 infection. PLoS. Biol. 2: E20.